Find a book just for your kid! Find a book just for your kid! Select Category Age Group 0 – 3: Board Book 0 – 7: Picture Book 12 – 18: Young Adult 5 – 8: Beginning Reader 7 – 10: Chapter Book 9 – 13: Middle Grade Author interview Award-Winning by Angela Verges by Kathy Higgs-Coulthard by Wendy Lawrence Gender Book for boys Book for girls Books for boys and girls Genre Adventure Board Book Cookbook Fantasy Historical Fiction Mystery Nonfiction Parenting Book Picture Book Poetry Realistic Fiction Science Fiction Sports Giveaway Kids and willing parent activities On Reading On Writing Parenting Article Recipes: The Family That Cooks Together Uncategorized You (adult) should read it too! Grab my button! Link to me! I’ll be back to business-as-usual on the blog this week, but just a quick PSA for those of you who might be interested in a fantastic writing opportunity! Tara Luebbe is once again running her Writing With The Stars mentorship program and there is still time to apply. What is Writing with the Stars? Writing with the Stars is an opportunity for aspiring picture book writers and illustrators to win a free, three-month mentorship with a published author or author/illustrator. Mentors will help mentees further develop their craft and share invaluable advice and insight into the publishing world. When is Writing with the Stars? 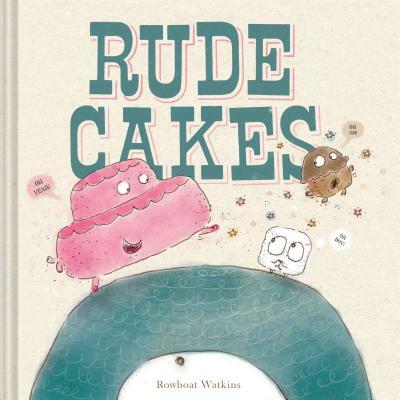 Looking at the cover of the picture book Rude Cakes, I wasn’t so sure what to expect. There was a picture of a cake smiling and presumably being rude (if you can judge a book by its cover) to the cupcake and marshmallow running away from it. What I didn’t notice on the cover is that the green hill-like thing on which the said confections are standing is actually the head of a cyclops. Yes, I expected a lot of things from a book called Rude Cakes, but the Cyclops wasn’t one of them. So that shows you about books and covers and judging things. But just as the rude cake is ignoring her parents’ specific instructions to go to sleep, she is plucked from her house by a Cyclops who understandably mistakes her for a giant hat. Cyclopses, you will find out if you have the good luck to get this book, love small hats and also are never rude. As for the rest? I think you just need to read it. This might be one of my favorite picture books I’ve picked up in a long long while. I love the humor. I love the randomness. The messaging is not subtle, nor does it need to be–it’s surrounded by total zaniness! My 7yo doesn’t read a lot of picture books anymore, but I still love to curl him up with one every now and then and this one will be perfect. The whole family will laugh. Is there any gift better than that? Thank you Rowboat Watkins! a girl named Cinderella dreamed of fixing fancy rockets. but late each night she snuck away to study ship repair. The books continues with the familiar but definitely new story. She can’t go to the ball because her spaceship is broken. But not to worry! The fairy godrobot is here–to fix the ship? No! To give her a new toolbox so she can fix it herself! Another twist parents who are sick of marrying princess might like: She says “no” to the prince’s marriage proposal and suggests she be his chief mechanic instead. This book is coming out in May 2015! 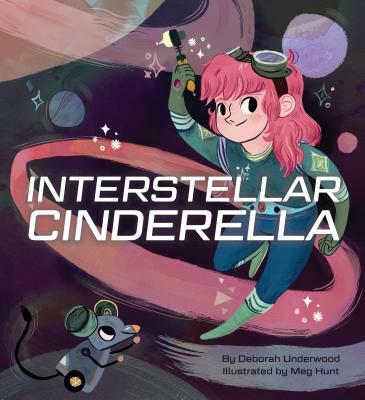 Parents can have fun talking with their children about the differences between this book and other Cinderella stories they’ve read. And asking them which parts they liked better in different versions. Then, it would be super fun to come up with your own version! Older kids might just be set free with some blank paper and colored pencils. Younger kids could fill in blanks as you ask them questions: Where do they want their Cinderella to live? In a forest? Under the ocean? On Mars? Guess what? April is National Humor Month. This is an ideal time to read a humorous book. 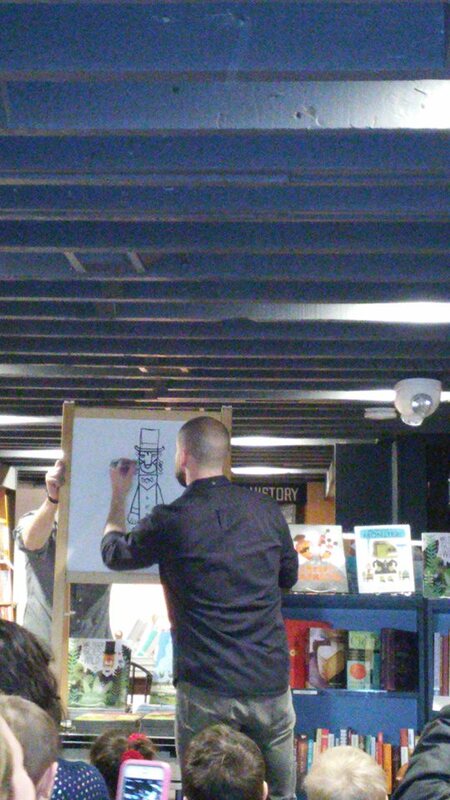 I recently had the opportunity to meet author/illustrator Peter Brown at a book signing. He was funny and so are some of his picture books. 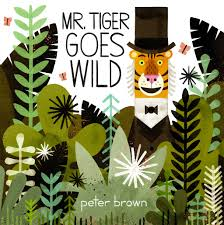 During his presentation, Peter Brown showed the audience how he drew the tiger from his book, Mr. Tiger Goes Wild. As he read the story, the kids in the audience roared and laughed along with the story. Add this to your reading list for April to see what adventures arise. 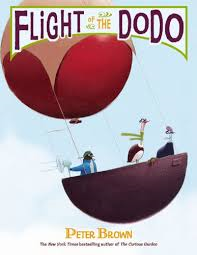 Add a bit of hilarity to your reading with another one of Peter Brown’s books, Flight of The DoDo. Mr. Brown’s humor begins on the first page when Penguin is pooped on by a goose flying overhead. What will happen next? Open this delightful book to find out what happens with Penguin and some of his bird friends. 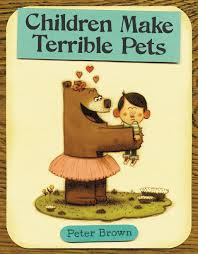 One more book to add to your list of humorous reading is, Children Make Terrible Pets, again by Peter Brown. Has your child ever asked to have a pet? In this story, the author has cleverly woven together a story about a bear who wants to keep a boy as a pet. In addition to reading humorous stories this month, you can also schedule a few fun family activities. Here are three to get you started? 1. Read a joke book. 2. Gather the family and have each person tell their favorite joke or make one up. 3. Do a silly dance, then laugh at yourself. What are some of your favorite humorous books or family activities that add humor to your life? Cooking is a science? Who knew! Did you know cooking could be a science? Phineas MacGuire found this to be a fact when he had to start cooking dinner every night. 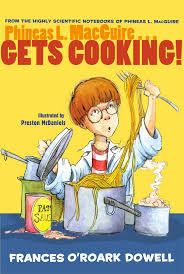 Phineas is a fourth grader and the main character in the book Phineas L. MacGuire…Gets Cooking! By Frances O’Roark Dowell and Preston McDaniels. Phineas loves science, but cooking is unfamiliar territory. When I read Phineas L. MacGuire Gets Cooking! I was reminded of times when my boys worked on science projects. Sometimes their experiments involved cooking up creations in the kitchen. Phineas’ journey began when he complained about eating pizza all the time (even though it was his favorite food). Title: Phineas L. MacGuire…Gets Cooking! Humor is used throughout the book to develop the character of Phineas and his friends. When Phineas is told that the babysitter, Sarah, will help him cook, he is less than excited. He doesn’t believe it will be time well spent. Phineas tells us that Sarah is “into” Purple and he is allergic to it. In the story it is Phineas’ friend who opens his eyes to the fact that cooking is science. She tells him that in fact, “It’s chemistry.” As Phineas warms up to the idea of cooking, he actually wants to prepare a dinner that will blow up. The reader is easily drawn in to this story through quirky characters, vivid images and amusing scientific facts. No protective goggles are needed to join the wacky scientific journey of this book. After spending time with Phineas and his friends, you are sure to discover a new way of combining science and cooking. Would you let your child incorporate science and cooking in your kitchen? Can I hear it for the series? Early readers like their series. Actually, intermediate, advanced, and adult readers like their series. I’m a fan of No. 1 Ladies’ Detective Agency, personally–do you have a favorite? But I’m getting off track. We were talking about early readers. Series are great for these kids because the books become familiar. They know the characters and the general plots. They get to know the structure of the book. Kids can read a higher level of books in a series because there is so much about the book that is comfortable and familiar. In this way, series books can both stretch a reader and give them easy reading practice. The Secrets of Droon – a great beginning fantasy series that has the advantage of having a lot of books to keep them busy for awhile. The books are short and fairly simple, although they can get a little dark towards the end of the series. But nothing too major. Beastquest – This is one of those formulaic series, but it was one of the first my son read and because there are so many, it kept him busy for quite awhile. The same author has a Deep Dive series (called SeaQuest in England), and a higher-level but still beginning fantasy series called Chronicles of Avantia. Oliver Moon is one of my favorites to recommend. It’s really fun, about a boy in magic school in a world where everyone is magic. This is a great starter series. Galactic Time Travelers is, I believe, a self-published series. We found it in a Seattle independent bookstore–or rather Great Grandma did–but I’ve also seen it online. I love this series because it’s five books long and each book is slightly longer and more complicated than the previous one. The fifth book is about twice the length of the first one. You can practically watch your kids learning how to read as they go through this series. Plus, it’s one of my son’s favorites. If there’s ever a lull between finishing one series and a trip to the library, he picks this one up to read again. Hopefully that will keep your reading going for a little while, but I’ve got plenty more ideas where those came from! Happy reading! And if you or your young reader has a favorite series, please let us know in the comments below! Once upon a time in a two storied house in a small subdivision near a forest, lived Dreadlocks and his Mama Bear. And thus begins my fairy tale of living with a teen bear known as Dreadlocks because of his hair style. Did you now that February 26 is Tell a Fairy Tale Day? This is an ideal time to pull out your child’s favorite tale and read it over again. There are also fairy tales waiting to be discovered by your child. While reading an article in the Metro Parent Magazine. 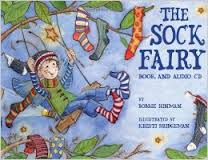 I discovered two interesting books – The Sock Fairy and The Knot Fairy. Have you ever begun to put away laundry only to discover mismatched or missing socks? This is the time to call on the sock fairy. Have you ever wondered why your child wakes up with knotted hair? There may be a magical explanation. The videos below will give you a peek the two fairy tale book mentioned here. If you’re looking for an activity to celebrate Tell a Fairy Tale Day, check your local library or bookstore. In Ann Arbor, MI, Crazy Wisdom Bookstore and Tearoom will hold a “fairy tea” story time on February 19. Turn your once upon a time into happily ever after on Tell a Fairy Tale Day – choose a fun but or activity to engage your child. My teens are not as excited about picture books as I am. I let them select a book of their choice to read before venturing off into other activities to relieve their boredom. As for my selection of reading, there are several books that I found entertaining. They all relate to being bored. I’m Bored by Michael Ian Black was the first book to jump off the library shelf and into my hands. The text is simple and kid friendly. The main character doesn’t think there is anything boring about being a kid. However, she has a hard time explaining that to a potato. She demonstrates all the things kids do for fun, but the potato was still bored. Through ninja kicks and cartwheels, the main character becomes exasperated trying to convince the potato to not be bored. 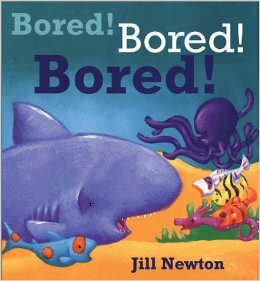 If your child continues to sing a chorus of “I’m bored” after reading this book, pull out another book. Bored Bill by Liz Pichon may stimulate his creative juices. 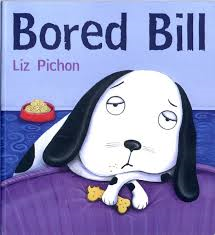 The main character in Bored Bill is a dog who is really bored, but his owner Mrs. Pickle, is never bored. Mrs. Pickle tries to convince Bill to try the things she loves like, reading, gardening and kung fu. Bill just grumbled and said he was bored. Something happens when Bill and Mrs. Pickle go for a walk. A gust of wind sweeps them into the air and land Bill into space. You’ll have to read the book to discover what happens on Bill’s adventure. 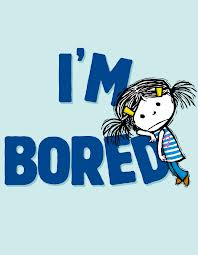 A final book in my collection of must reads is Bored! Bored! Bored! By Jill Newton. This book has brilliant colors and features sea animals. Claude is a shark who doesn’t want to do the things his friends are doing. When his friends don’t invite him to a party, Claude has to find the thing he loves to do that will get him back into his circle of friends. When your child shouts, “I’m bored!” give him a symphony of books to stimulate his imagination. Happy New Year and happy book reading! The Holiday season is upon us. It’s the time of year where folks all around the world celebrate in their special way. At our house it is a time where aunts and uncles, cousins, grandparents and friends feast together. My boys look forward to our Holiday gathering because they know something wacky is sure to happen. Although we don’t have antlers, my family members resemble the characters in the picture book Uncles and antlers by Lisa Wheeler. This holiday themed picture book uses rhyme and counting as we are introduced to a family of wacky reindeer. Uncle Uno had one hat. Uncle Duce who wore two wigs and bellowed out a tune, reminded me of myself singing at our annual Christmas dinner (off key). My brother could fill the role of Uncle Quint who is long and tall and shoots basketball. 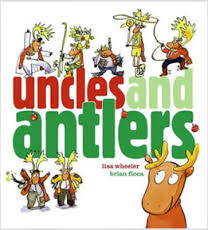 Add uncles and antlers to your reading list and see if you can find any comparisons to your family. Uncle and antlers had their wacky side and so does my family. No matter how silly our family Christmas dinner becomes, it’s always just right. 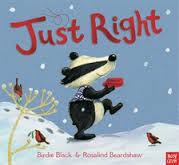 As I searched for more books to add to my holiday reading list, I came across Just Right for Christmas by Birdie Black. The story begins with the king buying a bright red cloth from the market. The cloth was used to make a gift for the princess. Once the gift was complete, the leftover scraps were placed outside the back door of the castle. The story continued with someone finding the scraps and taking them home to make an item for a family member. Each time the scraps were placed outside a door and another person received a gift. By the end of the story, the smallest animal around received a gift from the last piece of red cloth. Just Right for Christmas was a heartwarming tale of giving during the Christmas season. This book can be used to begin a discussion about the joy of giving or helping, not just during the Holidays, but at other times of the year. The next time you get together with the uncles and antlers in your family, turn it into a wacky celebration. Make it a joyous, just right occasion. What’s on your reading list for the upcoming Holiday season? Do you have a child who likes to collect…stuff? Over the years my son has collected football trading cards, Yu-gi-oh cards and a bunch of other things. A couple of times a year I would encourage him give away some of the things he no longer played with. The task was anything but pleasant. If you have a little pack rat who likes to keep everything, he might enjoy reading Stuff! Reduce, Reuse, Recycle. This is a story about a little pack rat named Pinch who keeps everything from magazines to toy cars, boats and games. Pinch had so much stuff that it was spilling onto the street. You will have to read the story to find out what Pinch does to reduce, reuse and recycle. Expand your child’s knowledge of recycling by creating green crafts. You can find a variety of projects in the book Cool Crafts with old Wrappers, Cans, and Bottles by Carol Sirrine. Cool Crafts tells you how to make projects reusing items you already have. Did you know you could make Itty Bitty Frames using metal bottle caps? It’s as simple as gluing a magazine a small picture into the cap and adding a magnet strip. 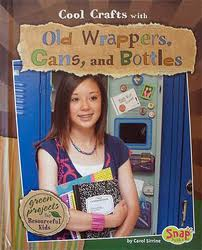 Do you have a suggestion of things to do for America Recycles Day or a favorite book related to recycling? 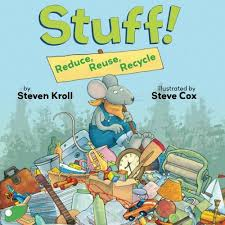 Tags: Angela Verges, Carol Sirrine, Cool Crafts, crafts, picture book, Recycle, Reduce, Reuse, Steve Cox, Steven Kroll, Stuff!